Background ‘Emotion work’ is a term used to describe the emotional responses that may arise in qualitative research exploring difficult experiences. Parents’ experiences of neonatal care can raise sensitive issues during interviews, which may lead to emotional responses. Aim To reflect on an interpretive study involving narrative interviews with parents of preterm neonates, to inform researchers about the potential emotive issues that may arise in such work. Discussion Reflection on interviews with parents of preterm neonates revealed areas for discussion relating to emotion work, the role of the researcher, emotional connections and empathic interviewing. Consideration of these areas highlights the importance of reflexivity for researchers. 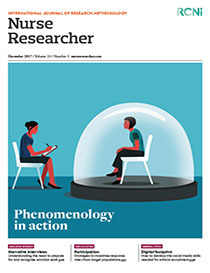 Conclusion Qualitative researchers undertaking narrative interviews should be prepared for emotive issues that arise and recognise the need for emotional intelligence. Achieving a balance between being an empathic, emotionally aware interviewer and remaining objective can be challenging. Implications for practice Strategies that researchers can use to address this balance and to manage the emotion work involved in research of this nature are provided.